Warlords Battlecry 3 Game Review - Download and Play Free Version! Play one of 16 races, build a hero, & fight your way through the ruins, jungles and deserts of Etheria! Warlords Battlecry 3 has you joining with the many races of Etheria as you fight your way through the ruins, jungles and deserts of the southern continent of Keshan, searching for new lands to conquer, and the treasure with which you might build an Empire. Warlords Battlecry III further expands the Battlecry tradition of featuring persistent RPG-like fantasy heroes that get stronger with every level while fighting massive battles in the Warlords' world of Etheria. Upgradeable castles to reflect your importance and influence in the world of Etheria. Extra features included in Warlords Battlecry III are specifically geared to please the legions of previous Battlecry players, including the removal of hero and unit caps, the addition of new special abilities for high-level heroes and the creation of an intuitive hero system. Warlords Battlecry 3 is a real-time strategy title that throws you into the turmoil plaguing the land of Etheria. All the key RTS elements are present within this fantasy adventure with a variety of races to choose from, units to train, bases to build, and resources to collect, but Warlords throws in some interesting twists that help it to stand out from the rest. For starters, resources are collected in a slightly different manner since you convert mines with your hero character and then they constantly increase your reserves at a steady rate. You can increase the speed at which they mine by adding in peasants as well. This simplification of resource collection is really quite nice and lets you focus in on raising your army and defeating your foes. Probably one of the most intriguing features to Warlords is the use of Hero characters and how they can transfer between the campaign, skirmish, and multiplayer modes. 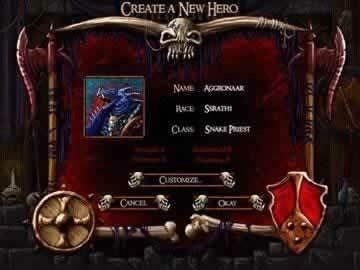 There are several options at your disposal when creating a Hero profile such as a variety of races, like orcs, minotaurs, barbarians, dwarves, undead, humans, and elves, as well as choose from 28 different classes, like warrior, healer, defiler, alchemist, bard, sage, and ranger, all of which affect their initial stats providing plenty of flexibility. What is great about the Hero characters are how they affect your strategy since they can convert mines, build buildings, collect beneficial items, perform quests, and gain levels to increase the benefits they supply to any units within their command radius. The focus on heroes adds an interesting angle to the gameplay and helps to draw you into the action as you start to care about them after gradually building them up into legendary figures. There aren't many issues with Warlords Battlecry 3 except that perhaps the AI can be a bit predictable, especially during skirmish mode. For example, it is all too often on smaller maps that the AI will send in their hero to attack your base too early to try and capture your resources, thus making him an easy target. Also, while the graphics are decent they are a bit dated and might pale in comparison to more modern titles. Yet, these do little to detract from the addicting gameplay and are for the most part very minor. Overall, Warlords Battlecry 3 introduces some new and interesting features to the RTS formula that provide many new and intriguing strategic elements. The gameplay is both fun and extremely addictive with the simplified resource gathering and hero characters. The sheer quantity of play options with the lengthy and somewhat open-ended campaign, flexible skirmish mode, and multiplayer mode should provide hours upon hours of play. So if you are new to the RTS genre or looking for something with a few new twists, Warlords Battlecry 3 is the perfect game for you. 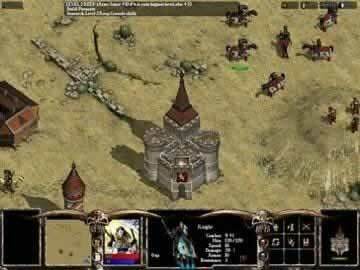 Player created video showing opening scenes and some battles.